Over the past few months our digital team in collaboration with the Information, Advice and Guidance service area have undertaken a re-design of the Advice services which has just gone live. It has been a complex piece of work that has involved working with the teams from Debt Advice, Help with benefit appeals (formerly Welfare Rights), Contact Centre and Local Advice Centres and we have had a number of challenges to overcome. Stockport Council offers a service where Stockport residents can get specialist help to appeal a benefit decision or manage their debts. Citizens can access initial, non-specialist advice from any Local Advice Centre (based in libraries), or from third sector voluntary organisations such as Citizens Advice Bureau. If their case requires further specialised help they can be referred from their initial advice appointment to our specialist advice teams. They can also self-refer themselves via the Contact Centre or the council website for triage. Why was a re-design needed? The existing systems and non-transactional PDF forms required heavy manual data input by both the Advice team and Business support. The access databases used were legacy systems, unsupported and unreliable with a high level of system downtime. The paper forms were expensive to store and retrieve and presented a higher possibility of data breaches. Multiple outlook calendars were required to manage appointments across different teams. High postage costs were incurred which could be reduced by moving to email as the preferred contact method. We conducted user research with citizens and referring organisations with the goal of finding out how clients currently access information and contact the service so that we could discover issues and discuss recommendations with users. 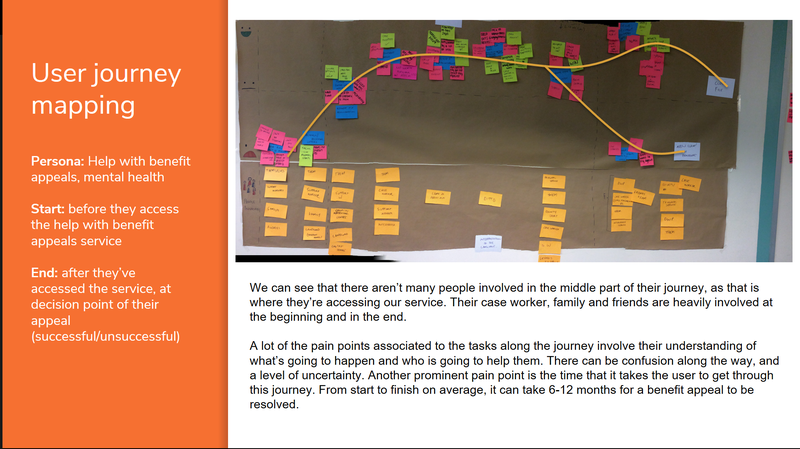 We facilitated a series of workshops to understand a typical user of this service and their needs. This helped to design a better user journey through the service and design online forms that better meet the needs of these users. During the workshops the service helped us to create “personas”. Personas are a visual representation of a typical client that make thoughts, feelings, pain-points and needs more real for the team designing the solution. 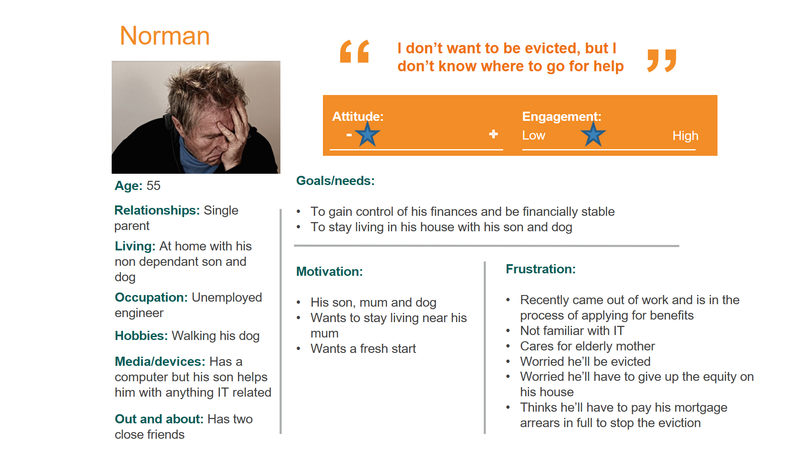 One of our personas was “Norman” who represented the needs of a typical client for the debt team. 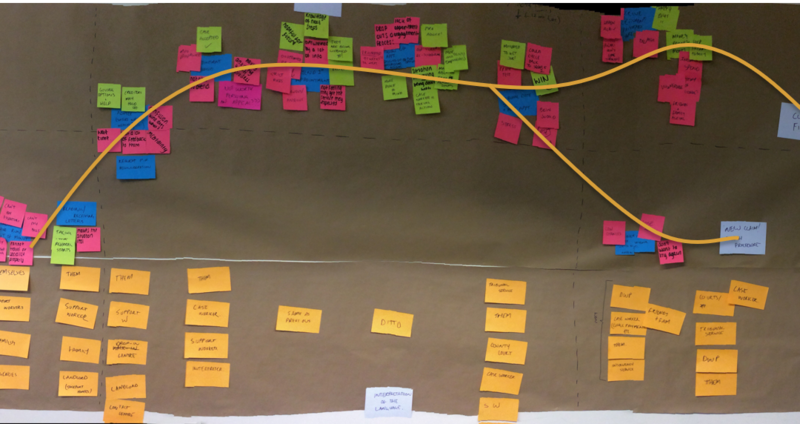 I was really impressed with the user journey workshops. I thought that the team were very creative in their approach. They put in a lot of effort to find out how we work, the needs of the customers and other organisations that access the service. There was a lot of positivity and everyone was encouraged to contribute. It was good to have the opportunity to think about the needs of the customer and to get input from an outsider’s perspective. We have reviewed and rewritten content on the council website for Benefits Support and Advice and Debt Advice and updated the Better Off website. This involved our web content team working collaboratively on a content audit and using pair writing with the service. We have also built an internal online form for debt advisors to manage their interactions with multiple creditors. We have introduced Verint as the new case management system. We are already using Verint to manage customer contacts in other service areas and we have now configured it for managing debt and benefit referral cases, creditor cases, email templates and mail merge. This includes revised Contact Centre scripting for Advice calls. Our Booking system has been set up for the service to manage their client appointments at Fred Perry House reception and for home visits, and email templates have been created to replace appointment letters. For the residents this will mean a more efficient service, with quicker referrals and updates on progress. The updates have just gone live and we will continue to monitor the user experience. Some of the most vulnerable people in Stockport don’t have access to email; haven’t got a computer; can’t get to a library to use a computer; don’t have mobile phones – how do they access the service? The service can still be reached by telephone through the contact centre and they also offer a home visiting service for their most vulnerable clients. The fact that the focus was helping people who are often in a vulnerable place in their lives, as well as the workers that help them is really refreshing and shows the value of the approaches you’ve taken as a team. Well done.